Mountain View, CA – Today eHealth, Inc (NASDAQ: EHTH) parent company of eHealthInsurance.com (www.ehealthinsurance.com), America’s first and largest private online health insurance exchange, released a ‘Cost of Comprehensive Health Benefits’ report as an addendum to its seventh consecutive ‘Cost and Benefits’ report, released in November 2012. This new report shows that average monthly premiums for individual health insurance plans are forty-seven percent (47%) higher than average when they cover a comprehensive list of eight health benefits. Average deductibles for plans that cover the same eight benefits are twenty-seven percent (27%) lower than the average for all plans. Since 2005, eHealth’s Cost and Benefits report has tracked the percentage of plans surveyed that cover eight health benefits deemed to be comprehensive by eHealth, including: Laboratory and X-Ray; Emergency Services; Prescription Drugs; Chiropractic; Maternity; OB/GYN; Periodic Exams; and Well Baby care. 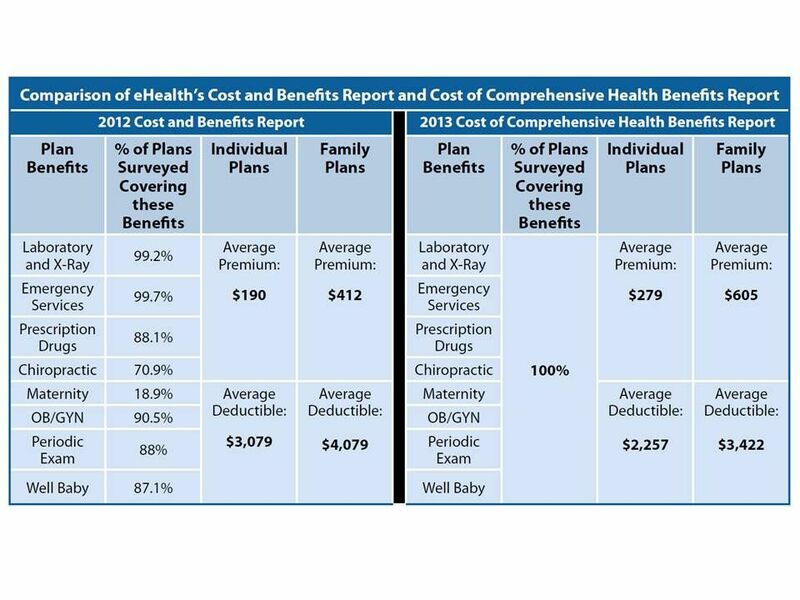 The new report, ‘The Cost of Comprehensive Health Benefits’ looks at the cost of just those plans surveyed that cover all eight benefits: approximately 30,000 individual plans purchased across 32 states through eHealthInsurance.com with coverage active in February of 2012 (see Table 1). The report also analyzed average monthly premiums for individual plans that cover all of the benefits eHealth tracks by age. Table 2 below shows the average premiums for all individual plans with comprehensive benefits by age-range. 1.The mandate to have health coverage - The requirement that all Americans – including the youngest and healthiest among us – purchase health insurance does not go into effect until 2014. Today, roughly forty percent (40%) of adults between the ages of 18 and 34 are uninsured, yet they make up less than a quarter (24%) of the total population, according to the Department of Health and Human Services (source). The individual mandate, requiring many people without employer-based coverage to buy health insurance on their own or face a tax penalty, could push more young, healthy, Americans into the risk pool, which may help to lower prices. 2.Annual coverage limits – Beginning in 2014, Qualified Health Plans cannot place annual dollar limits on the coverage of essential health benefits. Guaranteed issue – This is a requirement of the Affordable Care Act stating that applications for individual and family health insurance plans can no longer be declined due to a pre-existing medical condition. Community rating - The Affordable Care Act requires that health insurance plans can only vary rates – what they charge for a plan - based on the applicants age, where they live, family size, and tobacco use. Price increases relating to these factors are limited to a 3 to 1 ratio for non-tobacco users. Tobacco users may be charged up to fifty percent more (a 1.5 to 1 ratio). Comparisons of average premium costs for plans with comprehensive health benefits in the report were derived from a sample of more than 30,000 individual major medical policies purchased through eHealthInsurance with coverage in effect in February 2012. In most of the states used in this analysis it is possible for applicants to be declined coverage for individual health insurance coverage based on an insurer’s review of their medical history. The full addendum report, titled the ‘Cost of Comprehensive Health Benefits,’ is available online through the eHealthInsurance Media Center. The larger ‘Costs and Benefits of Individual and Family Health Insurance Plans’ report, released in November 2012, is also available.